A thrilling novel from New York Times bestselling author Lisa Unger about the hunt for a missing girl and one community’s intricate yet fragile bonds. As she tries to reassure him that Rick embodies his father in all of the important ways, Maggie realizes this might be exactly what Jones fears most. Determined to uncover the truth, Maggie pursues her own leads into Charlene’s disappearance and exposes a long-buried town secret—one that could destroy everything she holds dear. Lisa Unger is an award-winning New York Times and international bestselling author. Her novels have sold over 1 million copies in the U.S. and have been translated into 26 different languages. "This one is a stunner...Unger’s genius is in plotting the story so that the reader never knows what’s coming next...This is a read that will stay with you." "Unger skillfully builds suspense by alternating point of view from chapter to chapter... Too many thrillers rely on coincidence or outlandish twists to connect the dots in a crime investigation, but Unger makes that process organic by using the interconnectedness of her characters' lives over the decades — these people really do know each others' secrets. Even apparently unrelated threads — like the chapters about the exterminator called in to trap the raccoons in Elizabeth's attic — are cleverly woven into the plot. Unger is also adept at drawing believable characters and relationships. Much of the emotional weight and considerable tension of Fragile have to do with families, with how parents and their children relate (or don't) and how husbands and wives can think they know everything about each other — and then find themselves surprised." "If you're a fan of Jodi Picoult's family chronicle storytelling, you'll enjoy Fragile, too. It's set in a small affluent town outside New York, where everyone knows someone who kissed the pizza guy once and many have ugly memories and buried secrets. When a teenage girl goes missing, the lives of all who knew her unravel. Unger balances nicely the suspense of her missing person story (a layered one when the vanishing of another teenage girl 30 years earlier is connected) with deeper sentiments. How do you live in the present when the past has broken you?" "Best-selling author Lisa Unger has made her mark with a string of successful thrillers —Beautiful Lies, Black Out, and Die for You. While her new novel, Fragile, has a mystery (or three) and often unfurls with page-turning suspense, it also mines the more intimate territory of family and community dynamics, inspired by the disappearance and murder of one of Unger’s own schoolmates more than two decades ago... In the style of Jodi Picoult, Fragile tells its tale through the real-time action and freighted recollections of a diverse cast of characters living in fictional The Hollows, a small town 100 miles outside New York City with a reputation for quaint charm. In reality, The Hollows is rife with dysfunction, full ofugly memories and buried secrets." "The never forgotten, complicated, and sometimes dangerous entanglements that can arise from growing up in a small town are compassionately and insightfully portrayed by this new suspense thriller from Unger. Perfectly balancing the need for independence from one's past and the indelible ties that persist regardless of any attempt otherwise, Unger creates a tale that's full of realistic characters that will remind readers of either someone they know, or perhaps even themselves. And filled with perfectly written passages that are worthy of being read twice also serve to make this read an intense journey that evokes a surprising amount of emotion. As does the beautifully written side-story involving the man (and his new love) who will eventually provide important clues in the case. Unger reminds us with a persistent grace that while the past is physically over, it remains a part of who we are. Poetic at times, heartbreaking at others, and suspenseful throughout, this is easily the best book of the year and comes with the strongest recommendation we have." "Lisa Unger writes psychologically in-depth stories with great characters. The plot is fast-paced and has many twists." "While Lisa Unger shows amazing skill at plot development, pacing, and projecting a rich sense of place, her talent in characterization - in plumbing the depths of her characters' inner circumstances - is truly exceptional... Though something of a departure from her recent thrillers, Lisa Unger's FRAGILE shines with her signature talent and generates plenty of suspense." "Lisa Unger brings this little town alive with flourish, probing the tragedies and the victories of the citizens of The Hollows. Each character has a multi-layered complexity and his or her own dangerous flaw unseen in most novels. Unger, the bestselling author of BEAUTIFUL LIES, SLIVER OF TRUTH, BLACK OUT and DIE FOR YOU, has a rare talent for exploring the vast pallet of human emotions, and she wraps that talent around a highly intriguing story." "A rich tapestry of psychological wounds...Cleverly plotted and emotionally engaging." "Compelling and true to life characters...highly recommended." "Unger’s taut and edgy tale stealthily plumbs the depths of desperation that grow more dangerous with the passage of time." 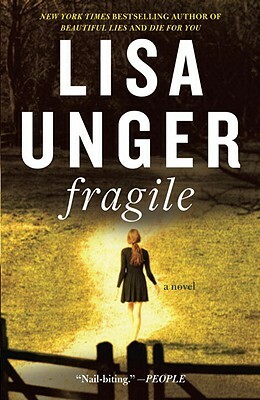 "FRAGILE delivers everything that Lisa Unger's readers have come to expect — a thrilling story that affects complicated and nuanced people. But it's also a sensitive meditation on the very nature of family and community and the ties that bind us to one another."